On 20th May 1536, Eustace Chapuys, the Imperial Ambassador, wrote to Seigneur de Granvelle informing him of the latest developments in London. He informed him that at 9am on the 20th May 1536, just a day after Anne Boleyn’s execution, Henry VIII and Jane Seymour were betrothed in the King’s lodgings. 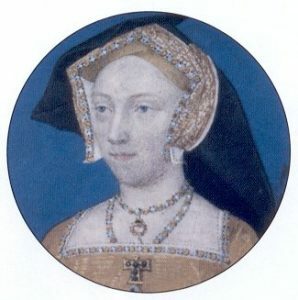 Chapuys was no friend of Anne Boleyn and was hopeful that Jane would help to restore the Lady Mary to the succession, but even he found this betrothal distasteful, commenting that, “everybody begins already to murmur by suspicion, and several affirm that long before the death of the other there was some arrangement which sounds ill in the ears of the people; who will certainly be displeased at what has been told me, if it be true”. He also reported that on hearing news of Anne’s execution, Henry VIII had immediately gone by barge to see Jane. I wonder how Henry felt? Did he have any feelings about the death of his wife or had he already moved on in his mind? What Chapuys’ report shows us is that Henry and Jane’s relationship was surrounded by gossip. We know that there had already been pamphlets deriding Jane circulating in London and now the speed of this new relationship was causing ill feeling and sympathy for Anne Boleyn. Time to blacken Anne’s name some more and get the propaganda machinery working. Information from a chapter of Claire Ridgway’s The Fall of Anne Boleyn: A Countdown. Jane… Jane… Jane… I think Anne was dead to Henry as soon as the miscarriage and jousting accident happened. So Henry beginning with Jane once the formality of the execution happened is no great surprise. But Jane must have been feeling cautiously optimistic. She was one son away from greatness or defeat. I think Mickey’s right to a point. The miscarriage and jousting accident was the point of no return in the marriage. There is no doubt that Henry then turned to Jane. However, the complication remained that Anne was alive, and Anne was Queen AND that Henry had loved her once and moved heaven and earth for her. I think at court, among the Seymour faction, there was fear that Anne, known for her ability to enchant and have the support of influential men, could find some way to cast her spell upon the King again. There are mentions of times Henry and Anne did spend together during those months. It is possible they were not all fraught with tension and hate…. Anne certainly did not see the May events happening. I’d have to review my research but I think they spent some pleasant time together around Easter of that year. I think Henry was done with Anne, but I think his courtiers were wiser and knew he would never truly be done with her unless she was dead. (Look at Elizabeth Taylor and Richard Burton, for example who kept finding their way back to one another, or for whom the other was an elixir beyond temptation at times… I think the bond between Anne and Henry had been deep, and the only way to make sure Anne’s influence did not resurface was to have her die.